James Derry has a degree in graphic design from the University of Georgia and he's got already three books on Amazon. More about him on his page here. 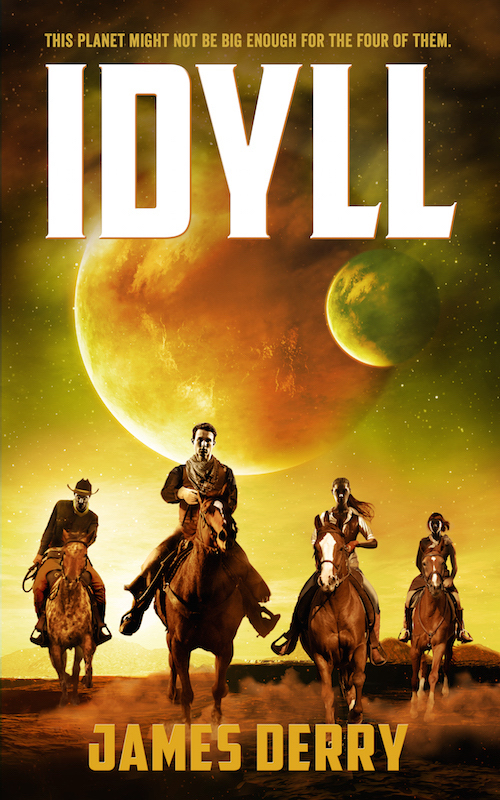 You can purchase Idyll on Amazon. I believe the book’s idea is very interesting and it left me thinking to where our society is headed. We are constantly looking for technological advancements and we forget that our planet is full of natural treasures and can provide for our existence. One of the ideas that stuck to my mind is that we have forgotten that the machines are supposed to work for us, not the other way around. Each chapter is written at the third person, but depicting the thoughts of one of the brothers. Walt and Samuel’s journey to the city-ship of Marathon where they hope to find their father is as well a journey to accepting and understanding the differences between them. Walt has a background in medicine, and was an apprentice at his uncle’s medical clinic. Samuel was raised by his father to become a ranchman and take over his family’s lands. When they meet the two sisters, both brothers will start planning a future, but even with this they still put their family first when need be. I would divide the book in three parts: the beginning where we learn about how the main characters decided to leave home, the road to Marathon – after the brothers meet the Bridge sisters and the revealing - when they understand the world they live in. My rating is 5 stars, even though it can be a little boring in the beginning and to be honest I did not like Miriam and Virginia’s personalities. I decided to overlook these issues because the concept is very intriguing and has a powerful message. One cannot reset the course of life or human evolution just like that. We need to learn how to treasure Mother Earth as there’s no other planet as beautiful as her.